It is important when practicing these lead notes to keep the A chord held down - however you don't need to hold it in a vice like grip as you may need to slightly reposition it to accommodate some of the notes being played above or below. 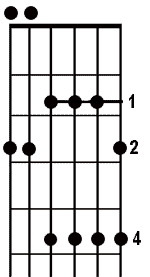 The first tab and the diagram show the main notes used.It's best to work on these first. I will be adding a few more notes later in the tutorial - the example in this lesson of a C# note being used is shown in the second tab.